The NEW advanced sublimation machine, the OK-405RW, was designed to accommodate the need for faster transfer speeds by our innovative engineers. The workable widths are 128″ and 220″. The OK-405RW was designed with a pivot system for automatic belt tracking, which ensures no lateral movement and “ghosting” on any of your fabric. 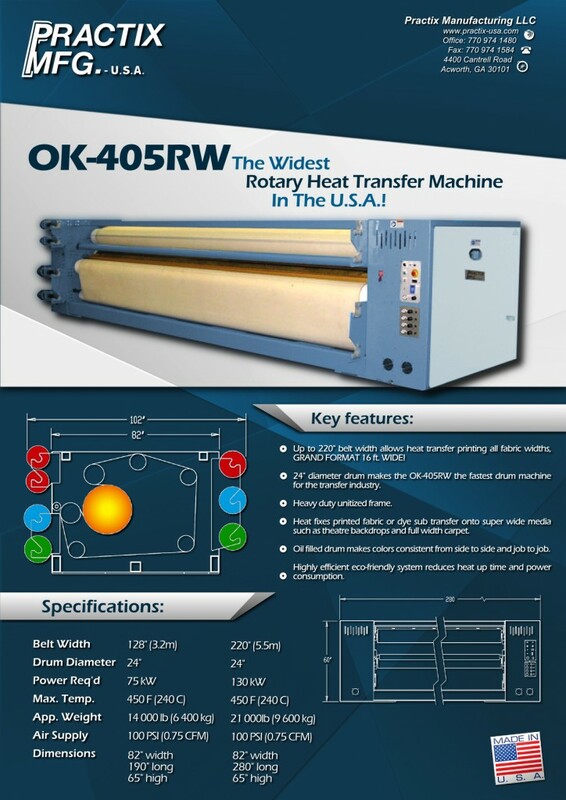 The OK-405RW encompasses even heat to ensure color intensity across even wide fabrics utilizing an advanced technology, well engineered oil filled, steel encased heating drum. This machine enables owners of machines that are struggling to keep up with the increasing speed of newly available industrial printers for the market. Our machine is able to print 10ft/min! Up to 220″ belt width allows heat transfer printing all fabric widths, GRAND FORMAT 16 ft. WIDE! 24″ diameter drum makes the OK-405RW the fastest drum machine for the transfer industry. Heat fixes printed fabric or dye sub transfer onto super wide media such as theatre backdrops and full width carpet. Oil filled drum makes colors consistent from side to side and job to job. Highly efficient eco-friendly system reduces heat up time and power consumption. As an added benefit, the OK-405RW sublimation machine was ergonomically designed to reduce operator fatigue and boost productivity. The machine’s rewind and unwind stations were placed at a height that virtually eliminates the lifting of heavy rolls of per or fabric overhead. Furthermore, the input conveyor is low to the ground for even more convenience. All of these advances – combined with the quality, forged steel frame, one-year mechanical warranty, and six-month electrical warranty – make this sublimation machine an unbeatable value. In addition, we offer next day and worldwide shipping. Call or e-mail us today to learn about all of our quality heat transfer machinery available to your business anywhere in the world.